People lucky enough not to follow me on Twitter will be unaware that I’ve been avoiding booze for the past period of time as I’ve been on painkillers of heroism. Despite regular exercise and desperately trying to be less tall I knackered my back again. I’ve managed without any of the really mind-buggering pills today so it is unquestionably time for one of the most necessary requirements for continued existence: German Riesling. It may be February and not exactly warm here in sunny Winchester, but it is sunny, and almost any sunny afternoon calls for German Riesling. Almost any afternoon calls for German Riesling – it just has to be consumed in order to remain in contact with civilisation and enlightened ideas. Willie Schaefer is, as all proper types know, one of the main people you need to drink when life demands you need to feel a tad more together about everything. This one of his is a cracker – many thanks to Linda and Douglas for donating this to the ‘continuing civilisation’ fund. A perfectly enlivening and reasonably exciting nose of pure lime fruit and direct gravelliness. It’s focussed and linear with good complexity for such a small-scaled wine. It is may be a bit forward, but isn’t that so often the case with Willi Schaefer wines? It’s certainly not to be disapproved of, and five years isn’t so young for a Kabinett to be showing as ‘developed’ if we are less boringly wine-obsessive about things. Yummy, scrummy, up-my-nose – that’s the basic message I’m trying to get across as I describe sniffing this; it’s just a total corker. Fruity, stony, with shades of aged complexity whilst not lacking any life – yeah, that’s it. It tastes a joy. It has great fruit that’s more than hinting at maturity, thrilling, nervy acidity that makes the whole palate pulse with life, lovely, complex minerality and all bound up in a gestalt whole that commands you to drink with uninhibited pleasure. You don’t even have to think about it too much, really, just drink and feel your life being improved as the fingers of acidic pain reach out from your stomach and tighten their grip on your entire being. Obviously, being in severe discomfort with a damaged back has been a bit of a blow, but, now I think about it, largely because it’s inhibited my German Riesling Kabinett consumption. And who can look favourably on anything that has such an effect? Thank you, Amy! 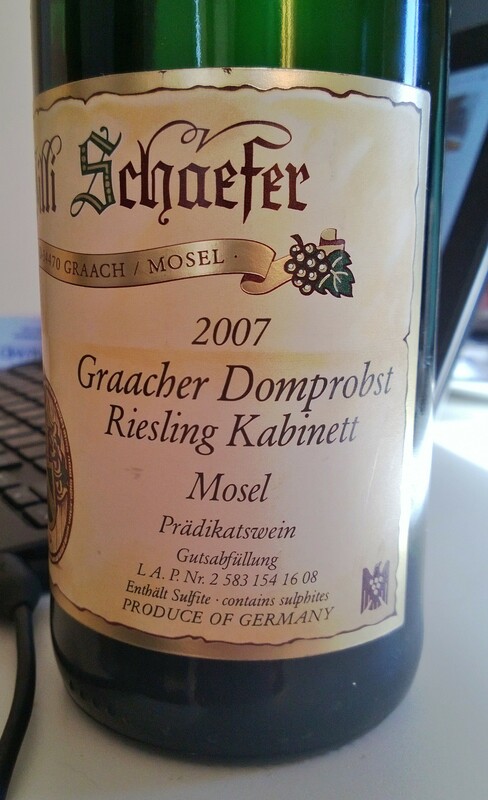 It was a really delicious wine, and German Riesling should be delicious, so everything worked out just fine.